The Pan-American Challenge Comes To New Orleans! More prizes announced plus a special awards package for the Masters winner. 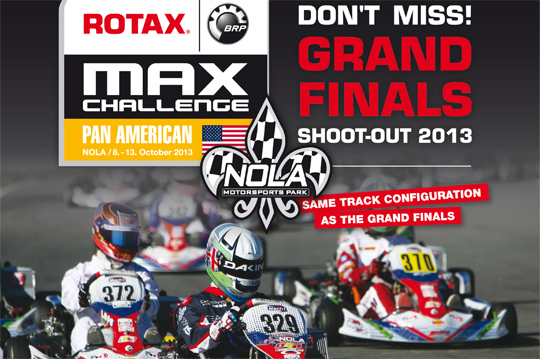 The MAXSpeed Group, the US exclusive distributor for Rotax MAX engines and related products, is pleased to announce some exciting news regarding the upcoming Pan-American Challenge, October 8-13 at NOLA Motorsports Park in New Orleans. As of this release, pre-entries are way ahead of last year. Even with a few days to go before the pre-entry deadline of September 30th, the entry count is already up 40% over last year's total entry count. This is a true international Rotax event with Grand Finals tickets up for grabs and tickets to the Micro & Mini Invitational. With roughly one third of those drivers pre-entered being international entrants, this event will be the best chance to simulate the Grand Finals for those planning on, and hoping to attend. Let there be no doubt, this event is going to be a Shootout! Newly announced for the Pan-Am is a fantastic prize package for the winner of the MAX Masterscategory. For this year's event, the Masters winner will receive a special Grand Finals VIP Experience sponsored by the MAXSpeed Group. This prize package will include 2-Round trip airfare tickets (up to $500 for each passenger), 1-Hotel room for the entire stay (November 10th - 16th. ), 1-Rental car by our Partner Enterprise (Rental car must be rented in drivers name with covering insurance liabilities), 2-Opening party tickets, 2-VIP pass (includes food), and 2-Closing party passes. With the MAX Masters awards put in place, this rounds out the awards provided through the sponsorship of our race event sponsors. the sponsors for the 7 classes are: Micro MAX - Koene USA, Mini MAX - Chase Racing, Junior MAX - Can-Am Karting Challenge, Senior MAX - Dallas karting Complex, DD2 - PSL USA, DD2 Masters - Goodwood Kartways, Masters Max – KartWorkz. Remember, September 30th is the last day to Pre-Register and save $100 on your entry. More information can be found on the Pan-American page at www.PanAmericanChallenge.com including the event schedule, event structure and the information guide.